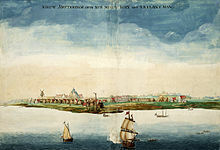 February 2, 1653: New Amsterdam is incorporated. January–June – The Swiss Peasant War is fought. January 3 – By the Coonan Cross Oath, the Eastern Church in India cuts itself off from colonial Portuguese tutelage. February 3 – Cardinal Mazarin returns to Paris from exile. March 14 – A Dutch fleet defeats the English in the Battle of Leghorn; the Dutch commander, Johan van Galen, later dies of his wounds. April 20 – Oliver Cromwell expels the Rump Parliament in England. April 28 – The Great Fire of Marlborough destroys 224 houses and much of the textile businesses in the Wiltshire town which, "at that date was one of considerable importance, and had merchants of affluence and repute.". May 31 – Ferdinand IV is elected King of the Romans. June 12–13 – First Anglo-Dutch War: The English navy defeats the Dutch fleet in the Battle of the Gabbard. July 4–December 12 – Barebone's Parliament meets in London, England. July 8 – John Thurloe becomes Cromwell's head of intelligence. August 8–10 – The Battle of Scheveningen, the final naval battle of the First Anglo-Dutch War is fought, between the fleets of the Commonwealth of England and the United Provinces off the Texel; the English navy gains a tactical victory over the Dutch fleet. November – John Casor leaves Anthony Johnson's farm, after claiming his contract of indenture had expired. December 16 – The Instrument of Government in England becomes Britain's first written constitution, under which Oliver Cromwell becomes Lord Protector of England, Scotland, and Ireland, being advised by a remodelled English Council of State. This is the start of The First Protectorate, bringing an end to the first period of republican government in the country, the Commonwealth of England. The Morning Star Rebellion breaks out in Sweden, against Queen Christina. The Taj Mahal mausoleum is completed at Agra. Frederick William, Elector of Brandenburg reconfirms the nobility's freedom from taxation, and its unlimited control over the peasants. March 12–13 – The Treaty of Pereyaslav is concluded in the city of Pereyaslav, during the meeting between the Cossacks of the Zaporozhian Host and Tsar Alexey I of Russia, following the end to the Khmelnytsky Uprising in Ukraine, which had started in 1648 and had resulted in the massacre of many thousands of Jews. April 5 – The Treaty of Westminster, ending the First Anglo-Dutch War, is signed. April 11 – A commercial treaty between England and Sweden is signed. April 12 – Oliver Cromwell creates a union between England and Scotland, with Scottish representation in the Parliament of England. May 8 – Otto von Guericke demonstrates the power of atmospheric pressure and the effectiveness of his vacuum pump, using the Magdeburg hemispheres, before Ferdinand III, Holy Roman Emperor, and the Imperial Diet in Regensburg. June 3 – Louis XIV of France is crowned at Reims. June 16 (June 6 Old Style) – Charles X Gustav succeeds his cousin Christina on the Swedish throne. After her abdication on the same day, Christina, now the former reigning queen of a Protestant nation, secretly converts to Catholicism. July – The Russian Army seizes Smolensk, and the Thirteen Years' War starts between Russia and Poland over Ukraine. July 10 – Peter Vowell and John Gerard are executed in London for plotting to assassinate Oliver Cromwell. July 10 – Don Pantaleon, brother of the Portuguese ambassador, is executed after the death of an innocent man, following a fracas at the exchange in Exeter. August – Oliver Cromwell launches the Western Design, an English expedition to the Caribbean to counter Spanish commercial interests, effectively beginning the Anglo-Spanish War (which will last until after the English Restoration in 1660). The fleet leaves Portsmouth in late December. August 22 – Twenty-three Jewish refugees from Brazil settle in New Amsterdam, forming the nucleus of what will be the second largest urban Jewish community in history, that of New York City. September – Congregation Shearith Israel is founded as the first synagogue in North America. September 3 – In England, the First Protectorate Parliament assembles. September 12 – Oliver Cromwell orders the exclusion of 120 members of Parliament, who are hostile to him. October 12 – The Delft Explosion, in the arsenal, devastates the city in the Netherlands, killing more than 100, among whom is Carel Fabritius (32), the most promising student of Rembrandt. October 31 – Ferdinand Maria, Elector of Bavaria, is crowned. His absolutist style of leadership becomes a benchmark for the rest of Germany. November 23 – French mathematician, scientist, and religious philosopher Blaise Pascal experiences an intense mystical vision, that marks him for life. January 17 – The Treaty of Königsberg is signed, establishing an alliance between Charles X Gustav of Sweden and Frederick William, Elector of Brandenburg. April 1 – Lwów Oath: John II Casimir Vasa, King of Poland, crowns the Black Madonna of Częstochowa as Queen and Protector of Poland in the cathedral of Lwów, after the miraculous saving of the Jasna Góra Monastery during the Deluge, an event which changed the course of the Second Northern War. April 2 – The Treaty of Brussels is signed, creating an alliance between Philip IV of Spain and the exiled Royalists of the British Isles, led by Charles II. May 12 – The Dutch capture the city of Colombo, Sri Lanka, marking the start of Dutch Ceylon. July – In an attempt to rescue survivors of the Vergulde Draeck, a search party is sent ashore, in Goede Hoop's boat, which smashes against rocks and sinks; 8 sailors drown; 3 more disappear ashore. July 27 – A Writ of Excommunication is issued against Baruch Spinoza. July 28–30 – Battle of Warsaw: Led by King Charles X Gustav of Sweden, the armies of the Swedish Empire and the Margraviate of Brandenburg defeat the forces of the Polish–Lithuanian Commonwealth, near Warsaw. December 20 – The Treaty of Labiau is signed, between Charles X Gustav of Sweden and Frederick William, Elector of Brandenburg. Konoike Zen'amon (son of Konoike Shinroku) founds a baking and money-changing business in Osaka, Japan. Physician Samuel Stockhausen of the metal mining town of Goslar, Lower Saxony publishes his Libellus de lithargyrii fumo noxio morbifico, ejusque metallico frequentiori morbo vulgò dicto die Hütten Katze oder Hütten Rauch ("Treatise on the Noxious Fumes of Litharge, Diseases caused by them and Miners' Asthma"), a pioneering study of occupational disease. January 13 – Edward Sexby, who had plotted against Oliver Cromwell, dies in the Tower of London. February 6 – Swedish troops of Charles X Gustav of Sweden cross The Great Belt in Denmark, over frozen sea. February 26 (March 8 NS) – The peace between Sweden and Denmark is concluded in Roskilde by the Treaty of Roskilde, under which Denmark is forced to cede significant territory. March 22 – The ship Waeckende Boey is wrecked on the coast of Java; the four survivors walk overland to Jepara. May 1 – Hydriotaphia, Urn Burial and The Garden of Cyrus are published by Thomas Browne in England. June 3 – Pope Alexander VII appoints François de Laval vicar apostolic of New France. June 14 – Anglo-Spanish War (1654–60) and Franco-Spanish War (1635–59): Battle of the Dunes: A Spanish force attempting to lift a siege of Dunkirk is defeated by the French and English. England is then given Dunkirk, for its assistance in the victory. June 25–27 – Anglo-Spanish War: Battle of Rio Nuevo: A Spanish invasion force fails to recapture Jamaica from the English. July – Šarhūda's Manchu fleet annihilates Onufriy Stepanov's Russian flotilla, on the Amur River. July 31 – After Shah Jahan completes the Taj Mahal, his son Aurangzeb deposes him as ruler of the Mughal Empire. September 3 – Oliver Cromwell dies, and his son Richard assumes his father's former position as Lord Protector of England, Scotland and Ireland. 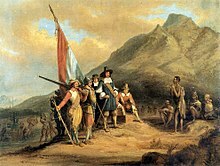 The Dutch in the Cape Colony start to import slaves from India and South-East Asia (later from Madagascar). ^ a b Palmer, Alan; Veronica (1992). The Chronology of British History. London: Century Ltd. pp. 185–186. ISBN 0-7126-5616-2. ^ "Time and Place". Slavery and the Making of America. Thirteen. 2004. Retrieved 2018-02-24. Rhode Island passes laws restricting slavery and forbidding enslavement for more than 10 years. ^ "Commonwealth Instrument of Government, 1653". Modern History Sourcebook. New York: Fordham University. August 1998. Retrieved 2012-07-10. ^ a b c d Williams, Hywel (2005). Cassell's Chronology of World History. London: Weidenfeld & Nicolson. p. 266. ISBN 0-304-35730-8. ^ "Guericke, Otto von". Encyclopædia Britannica. 9 (11th ed.). The Encyclopædia Britannica Co. 1910. p. 670. ^ "Jews arrive in the New World". American Jewish Archives. Retrieved 2012-07-10. ^ LeElef, Ner (2001). "World Jewish Population". SimpleToRemember. Retrieved 2012-07-10. Metropolitan Tel Aviv, with 2.5 million Jews, is the world's largest Jewish city. It is followed by New York, with 1.9 million. ^ Wu, Bin (2014). Britannia 1066–1884: From Medieval Absolutism to the Birth of Freedom under Constitutional Monarchy, Limited Suffrage, and the Rule of Law. Springer. p. 53. ISBN 9783319046839. OCLC 947041435. ^ Eisinger, J. (July 1982). "Lead and wine: Eberhard Gockel and the colica Pictonum". Medical History. 26 (3): 279–302. doi:10.1017/s0025727300041508. ISSN 0025-7273. PMC 1139187. PMID 6750289. ^ a b c "1657". British Civil Wars. Commonwealth and Protectorate 1638-60. 2010-06-07. Retrieved 2012-02-17. ^ Brems, Hans (June 1970). "Sweden: From Great Power to Welfare State". Journal of Economic Issues. Association for Evolutionary Economics. 4 (2, 3): 1–16. JSTOR 4224039. A swift and brilliantly conceived march from Holstein across the frozen Danish waters on Copenhagen, by Karl X Gustav in 1658, finally wrests Bohuslin, Sk'ane, and Blekinge from Denmark. Denmark no longer controls both sides of Oresund, and Swedish power is at its peak. This page was last edited on 27 July 2018, at 06:18 (UTC).